The revolution spearheaded by freedom fighters like Mama Chibesa Kankasa to emancipate the black man from white supremacy under colonialism was not easy. 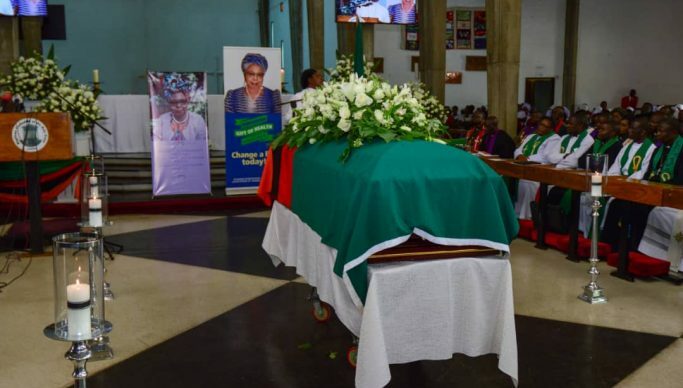 United Church of Zambia (UCZ) Synod Bishop Reverened Sydney Sichilima said Freedom fighters like Mama Kankasa, Dr Kaunda and Kapwepwe sacrificed a lot for Zambians to enjoy the benefits of freedom today. ‘When we were growing up, we had no freedom to walk in areas like Woodlands and Kabulonga. It took people like her (mama kankasa) to fight for black emancipation not only in Zambia but Africa as a whole.She is our hero”. He said. He said now Zambians have moved into these areas and occupied the mansions because Zambia is a beacon of peace. He pointed out that Zambians should not take the luxury of shopping in the many malls around because this came at the expense of people like Mama Kankasa who challenged the colonialists against buying groceries through a small window. Reverened Sichilima said Zambians have today gained confidence in their country as seen in times of sports where they unit in spirit of national pride. ‘That is even how the national soccer team proudly lifted the African cup trophy in 2012″ he said. He also appealed to Christians to emulate Mama Kankasa who stuck to her true principles of her faith in an era invaded by false prophets. ‘There are a lot of false prophets today who even feed snakes to the congregation but you have to stand firm by the biblical principles like she did’ he said. President Edgar Lungu has promised late Mama Kankasa that he will not destroy the legacy of freedom and peace that she and her fellow freedom fighters built during the struggle of independence. Addressing mourners at the funeral church service for the late mama Kankakasa at the Cathedral of the Holy Cross this morning, the president said it is heartbreakibg that politicians of today are slowly discarding the values that their forefathers died for. ‘ It is this fear of losing their legacy (freedom fighters) that gives us double grieving pain. I will miss your contribution to the political arena mama. Be rest assured that I will personally not put assander what you built he said.